Is Sport Good for Humanity? The first-ever global conference on faith and sport took place this week at the Vatican. For three days, representatives from the sporting world – athletes and competitors at all levels and of all ages and abilities – along with coaches, owners, managers, corporate sponsors and experts in fields ranging from sports medicine and psychology to training, discipline, education and formation, gathered together in the Vatican for discussions with leaders from the world’s great religious traditions to discuss how sport can be at the service of humanity. The conference organizers and sponsors – especially the Pontifical Council for Culture under its Cardinal-President, Gianfranco Ravasi – and founding partner, Allianz, hope over the long term successfully to foster a worldwide movement that will enrich lives by helping people, through sport, to build trust and learn cooperation, foster friendship, live healthy lives, and have fun. As a first incarnation of this vision, Allianz has encouraged the creation of the Humanity Sports Club – Humanity SC – to act initially as a motor for the nascent movement. The goal of the conference itself has been to unite people from every faith, nationality and culture through sport, in a common goal: to help the ones who need it most, especially the marginalized and the disadvantaged, and to encourage everyone to develop life skills, character, common values, and increase their capacity for the enjoyment of life itself. The Preamble to the Sport at the Service of Humanity’s Declaration of Principles states participants’ common commitment to the idea that sport has the power to celebrate our common humanity, regardless of faith, race, culture, beliefs, gender and ability. “Sport has the power to teach positive values and enrich lives,” the Preamble goes on to say, adding that everyone who plays, organises and supports sport, has the opportunity to be transformed by it and to transform others. Participants in the conference are further called to particular solicitude for all those, who are deprived of sport through lack of opportunity, prejudice, or vested interest. “We have a responsibility to help and share its benefits,” they say. This was a keystone of Pope Francis’ remarks to participants at the conference’s opening ceremony on Wednesday, October 5th. “I wish to encourage all of you – institutions, sporting societies, educational and social organisations, religious communities – to work together to ensure these children can take up sport in circumstances of dignity, especially those who are excluded due to poverty,” he said. 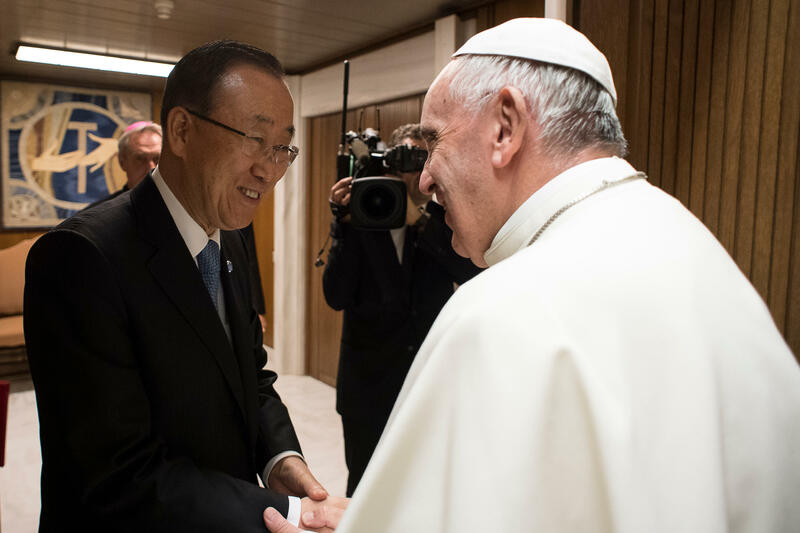 In addition to Pope Francis, the opening ceremony featured brief speeches from UN Secretary General Ban Ki-moon, IOC president Thomas Bach, and Allianz CEO Oliver Bäte. Sport at the Service of Humanity’s First Global Conference on Sport and Faith, ran from October 5th-7th here at the Vatican, and was organized by the Pontifical Council for Culture with the cooperation of the UN and the IOC, with the generous support of SSH Founding Partner Allianz.